Last Chance to Prove You’re the No. 1 Baseball Fan | Hupy and Abraham, S.C. Since April, die-hard baseball fans of the Milwaukee Brewers, Lakeshore Chinooks, the Chicago Cubs and other teams have been submitting photos that exemplify why they are the number one baseball fan of 2016. Submit your photo today; the month of August is the last chance to enter the Hupy and Abraham “Fan of the Year” photo contest! 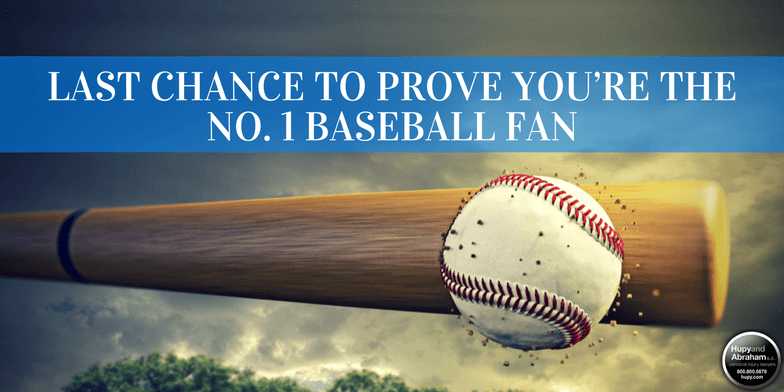 The fan photo that receives the most “likes” at the end of each month will receive a baseball Prize Pack and the two runners-up from each month will win T-shirts. One lucky winner was chosen in April, May and June, and the final winner will be announced at the end of August. Then, the winners from each month will go head-to-head during the final round in September. Visit the Hupy and Abraham Facebook Page and click on the "#1 Fan Photo Contest" tab to upload and submit your photo. Post your photo with the hashtag #HupyFanPix on Instagram, Twitter or the Hupy and Abraham, S.C. Facebook Wall. Email your photo to [email protected]. Visit the Hupy and Abraham Facebook Page, click on the "#1 Fan Photo Contest" tab and select the "Vote" option to view and vote for submitted entries. Time is almost up, so show your team spirit and submit your Fan of the Year photo today!